Is there a better alternative to FormMate? Is FormMate really the best app in Applications category? Will FormMate work good on macOS 10.13.4? FormMate enables you to fill out pdf files on your computer. It is a very simple process to open up a pdf, add text data to the pdf, add any image files that you need (an image of your signature, a check mark...), and print, fax, or save the filled in pdf to disk. FormMate "references" the pdf. It does not modify the pdf in any way. 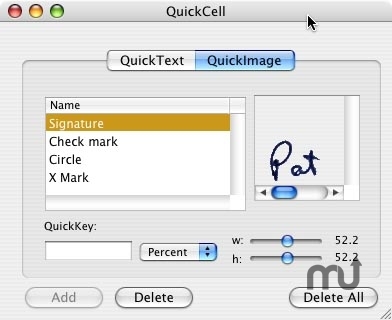 QuickCells allows the user to define commonly used text and images, and quickly add them to documents. You can include the pdf in the file (for portability to other computers), or reference the pdf, to save space. Fixed a couple of bugs, and a potential intermittent crash. You have unlimited scaling capabilities, for precise alignment of your inputs. Tools are included for layout and alignment of your data. You can readily see where all of the data that you have added to the pdf. FormMate automatically checks for updates at startup (you can disable this feature if you wish), and can automatically the newer version if one is found. This keeps you up-to-date with the latest version. FormMate is very inexpensive ($29.95) for what you get. You are welcome to download an unlicensed version to try it out. The unlicensed version has the full functionality of the licensed version, but does place a watermark over the document. This watermark disappears once you purchase and register FormMate (by simply entering a valid registration key).